We woke up at the villa early Saturday morning early. Lori needed to be at the airport by 11AM. We also needed to drop off the rental car. We said our final goodbyes to everyone and the five of us headed off (me, Jim, Laurie, Shahla and Lori, the gang of five). We got to the airport with plenty of time to spare, saw Lori off then too the Aerobus into Barcelona, about a 30 minute ride. We had reservations at the Hostal Campi, where we had stayed the first night after arriving from the US. If you are looking for an inexpensive place to stay in Barcelona, I would recommend it. Saturday Jim, Lauri and me walk the city finally enjoying a picnic dinner on the waterfront at sunset. 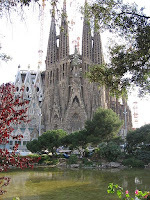 Sunday we met in the lobby early to visit Gaudi's Sagrada Familia. We wanted to be there a the 9AM opening to avoid the crowds. I selected the guided tour so I got a chance to walk through it before the tour. The guided tour was well worth the extra price. 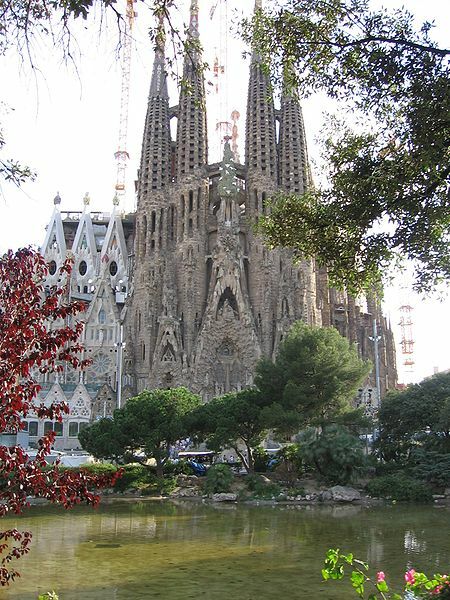 If you get to Barcelona, the Sagrada Familia is not to be missed. 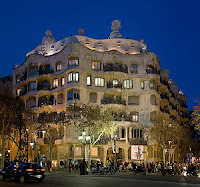 Seeing the Sagrada Familia made me what to see another project that Gaudi had done, a apartment building called Casa_Milà. Jim and I headed off to see it early Monday morning. It was an easy walk from the hostal. The building is a unique looking building with many innovative features. We toured the building for more than an hour starting at the roof, then the attic and then into one of the apartments. Not having quite enough of Gaudi, we then returned to the hostal to pick up Lauri and head off the public park that Gaudi designed as a housing development. I learned that Gaudi was a hugely creative force with 7 projects listed as UNESCO World Heritage Sites. You may not be attracted to his style, but there is no way that you would say that his work was boring. The bikebreaks owner, Dave, had suggested several rides during the course of the of our stay. One route, the ride around the volcano was the last one that we had not done yet. So we decided to finish up the final day of our trip with the volcano ride. We had calculated the ride to be about 55 to 60 km, a very nice ride. It started with a ride through Girona in a counter-clockwise circular pattern then climb up to the hills. Today was much hotter that previous days, at the start of the ride it was above 30 degrees C and much more humid as well, so by the time we were at the top of the climb the sweat was just rolling off our faces and arms. The next order of business was coffee, it was already after 10 and we knew that a little roadside cafe was not too far away on the route. So off we when down a hill, up a hill all in the heat and humidity. We came upon the cafe in a little while, only to find it not open. Shahla had heard noise inside the cafe and called inside to see when they were going to open, they responded in a moment. Five minutes later the front door opened and we had our coffee!!! We traveled on through some gorgeous roads climbing up, dropping down all under the view of mountain peaks. A very pretty day. We stopped for lunch about 11km away from the villa in a tiny town, where tucked away was a bar and cafe that was serving lunch. Happily munched on our sandwiches knowing that this was the final lunch for the bike trip. We headed back to the villa along GI-540. The heat was still with us and we decided to make one more stop for ice cream. Lori had persuaded everyone that it was a good idea, though she really didn't have to work too hard. We pulled into a small restaurant that we ate in the very first evening in the villa two weeks previously and they were open. In the past two weeks, we had stopped by the restaurant because they had wi-fi, but they had a very spotty record of being open. They seemed to have a special event of some sort going on and met us at the door and handed us ice cream cones through the door. I guess that didn't want a bunch of dirty smelly cyclists stinking up their special event. It was only about 1PM and as everyone was heading back to the villa, Lori and I decided that there was one more road that was left unexplored, a small road near the villa, so we headed down it. It started off as a hard packed dirt road, turned into a dirt path before turning back into asphalt. I still need to look at the map to figure out exactly were we traveled, but we popped out near a small town south of the villa and the only way back to the villa was to continue south before turning east and hooking up with GI-533. We came across a gas station where we filled up with water and soda and then headed off for the final 10Km or so. The route took us back over some roads that Philippe had taken us on last week, more quite winding hilly roads that we have become so fond of riding. As we pulled in the villa, bikes were being taken apart and packed for the trip back home. Since I had a rental bike all I had to do was wait for Dave the bike shop owner to pick up his bikes. The schedule time was 6PM. He and his wife arrived slightly after 6 and in no time the bikes were loaded into his van and with the closure of the van’s door, our bicycling vacation in Spain had come to an end. Lori came up with the idea to take the train from Girona to Figueras and then ride from the coast from there. Yesterday as research, we road into Girona and got three suggested routes from Dave at Bikebreaks. Last night we evaluated the three routes and selected the one that was not the most strenuous and not the easiest, but the one that seemed just right. As we plotted it out, it seemed like about a 60km ride, with two significant climbs of about 10km each. We got up early to make it to Girona in time for the 9AM train to Figueras. We left the villa about 7:30 arriving at the Girona train station at 8AM, got the tickets and were determined to have a cup of coffee before departing. At the ticket booth we also ran into an American, Dave a science teacher from the Midwest, who also was heading to Figueras on a day trip. The trip went quickly and we were in Figueras in about 40 minutes, then after a couple of minutes of catching our bearings we headed off, guided by Albert's GPS. After about 30 minutes or so, we were already out in the countryside and passed by a bakery were we stopped. Lori treated us to some cookies and finally after some wrong turns, we were back on the road. Pretty soon we started the climb, not too steep, but long and few pauses to break the climb. The trees were sparse, so the winding road snaking up the hill was visible but after each turn, you could see that there was another switchback climb ahead. It was also very sunny, not a cloud in the sky and was starting to get very very hot. When we were able to peak at the our lunch destination, Port de la Selva, from 'round a corner on the climb we stopped for a couple of minutes, pretty soon we were just drenching in sweat (normally as we bike, the sweat evaporates as we bike, when we stop for a short time, the there is no breeze to carry the sweat away and soon sweat is running off your nose, chine and arms sounds lovely doesn't it?). We were only 1/2 up the climb at this point and still had more twists and turns to go. But, as we started to top out the road started to level out and view became even more gorgeous. We came upon a monastery that I think is called "Sant Pere de Rodes". It's located high in the hills overlooking the road we were traveling on and was very imposing. We then started to drop down as we got closer to Port de la Selva and the ride really became fun as we sped down the road at breakneck speed. We stopped at the first beach side lunch stop that we found. We were ready for lunch and pretty thirsty. Like most of the restaurants, it took much longer for lunch than required, but finally we were back on the road. However over lunch we had decided to stretch out the ride by not returning to Figueras as planned, but to ride all the way back to the villa. We climbed out Port de la Selva on a different route heading to the town or Roses. Like this morning, the road was hot and unprotected from the Sun. We finally dropped into a urban area that we were able to find a gas station and filled up on water and soda before heading out on our new route back the the villa. It was at the gas station where Albert and I reviewed the map for possible routes back to the villa. It was going to be complicated with many turns over roads that we didn't have a clue about the conditions or how busy they were, but we pushed on because we had many miles to cover to get back home. We jumped on to a road that could only be called a major highway, riding on the shoulder, hoping not to get squashed like a bug by speeding cars. The next transition took a couple of turns to find the correct route, but from then on except for occasional map reading, we pretty much found our way on quite roads. The heat was starting to get to us and our water ran pretty low. We were so far out in the boondocks that we didn't run in to a gas station until we were closer to Girona. Then like previously, we filled up on water and soda. It was 6:15 by this point so I called the villa that we were running later than expected, but would be in about another hour. After winding our way through the Girona traffic, we were soon on GI-533 not too far from home. We arrived at the villa about 7:15 and found that they had dinner for us. A very pleasant surprise. This morning a quick trip to Girona was planned with a couple of goals in mind. The first was to gather information a potential ride in France, about 60km to the north and the second goal was find a cycling jersey a souvenir of the trip. We peddled in to Bikebreaks (http://www.gironacyclecentre.com/) that rented us the bikes that we've been using for the trip for some advice on the proposed trip. Dave explained the difficultly of what we had in mind, but proposed three trips from Figueras; hard, moderate and easy. He spent he time to outline them on the map, then we discussed the pros and cons of each ride and we discussed the aspects of traveling on the trains with bikes, because we were figuring on biking to the Girona station, then loading on the train and taking that to Figueras. We later stopped at the train station to confirm the departure times and the travel time. We can take take the bikes for free on the train and the trip duration is only 40 minutes. The second goal was to find a trip jersey. I talked to Philippe to find out where he bought his jersey. His wife Agnes gave me the business card of the store. Albert and I found the store and they had a couple of jerseys, I grabbed an orange one that I plan on wearing tomorrow. Yesterday's ride was wonderful and tiring, but I learned that some other riders; Albert, Lori and Shahla. So, bowing to peer pressure, I decided to do the ride again. The ride was identical to yesterday, but since I knew what to expect the climbs did not seem as difficult. An by 11 O'clock we were in Banyoles having not one, but two coffees before heading off to Olot. We landed into Olot a bit earlier than yesterday, but this time decided to make lunch out of the supplies at the Quickie Mart at a BP station rather then heading into Olot as we did yesterday. The supplies at the Quickie Mart are very different that those in the US. We grabbed a loaf of fresh warm bread, sliced cheese, yogurt and soda. Sitting on the curb, in the shade of the gas station, was not as elegant as yesterday's lunch, but it was almost as good and a whole lot faster. Next we headed off to the city center of Olot. When you get so close to a city like this you really have to check out the center of the city that is typically surrounding the stone church. By the time we got there it was about 2:45 and the stores and shops had already closed for the afternoon, closing at 2 and opening later in the day. We then turned southwest and headed for home, about 40km. It was warmer that yesterday and as we left town we could almost feel a tail wind, however reality soon came into play where as we left town, we slammed into a strong headwind. I think the headwinds were stronger than yesterday, because it was warmer than yesterday. For the first 10-12 km we pushed our way through the wind and fought the traffic as it zipped by. Eventually, the downhill started, but to keep moving we still had to peddle our way. Even at the downhill steepened we were not able to coast. But the time were got to Amer, not only were we tired by hot as well, the first time in our time in Spain that that the heat became a signification factor in our biking. We pulled into a gas station about 15km from the villa for some cold soda and a moment or two of rest until the final push. Within 4km we were off the busy road on to the GI-540, which has become a welcome final 10km to the villa. About 7km is a winding upward climb under the shading trees and on a windy day like today they became a block against the wind as well, a very welcome relief. As I was heading off to bed last night (Sunday), I saw several of the riders huddled over a set of road maps discussing the ride they took to the town of Olot, a distance of 120Km and about 6 hours of cycling. There were many comments of "you gotta watch out for.." and "don't miss the turn at..." and "if you take the turn at...you will end up in a tunnel". So I went over to listen to the discussion when Jim turned to me and said; "sounds good, wanna do it tomorrow?". It was going to be a long day. The five of us headed out about 9ish traveling in a counter-clockwise circle first through Girona heading north. It was good that Gary spent some time with us explaining the route in detail, because with out his advice, it would have taken the group much longer to find the correct route. The route started to climb shortly after leaving Girona. If you think of a clock, Girona was at the 3 O'clock position with us heading northeast after leaving Girona. The first stop for coffee was to be in the town of Banyoles, but several miles before we spied a field of beautiful sunflowers and just had to stop for photos. We spent maybe 20 or 25 minutes taking pictures of sunflowers, pictures of us with the sun flowers and pictures of us taking pictures of sun flowers. Thinking about our route and a clock face, Banyoles would at about 1pm position. We stopped in the city center for coffee, rolls and would you believe it, a Snickers bar? We had done some climbing to get to Banyoles, but we about about another 20Km of climbing would be required to get to our lunch stop in Olot. We arrived in Olot close to 2pm and found our way to the city center where the outdoor market was just closing. All the vendors were busily packing up their wares into vehicles. We found a place called "cafe sport" and discovered the 2 hour lunch. By the time we ordered, the food was served and we paid, it was 2 hours, 4pm. We had approximately 60 more kilometers to the end of the ride. Gary had promised that the rest of the ride was "down hill". After 13km we had started to doubt his word. Then the downhill began, and went on and on and on. It wasn't until Angles that the downhill flattened out. By that point we had about 15km to the villa along GI-540, which has some significant climbing, but has become a favorite with the group. By time we arrived, we had gone 122km taking almost 6 hours and climbing 3800 feet (1158 meters). A great day! !